The ultimate gamified exit-intent popup is here! 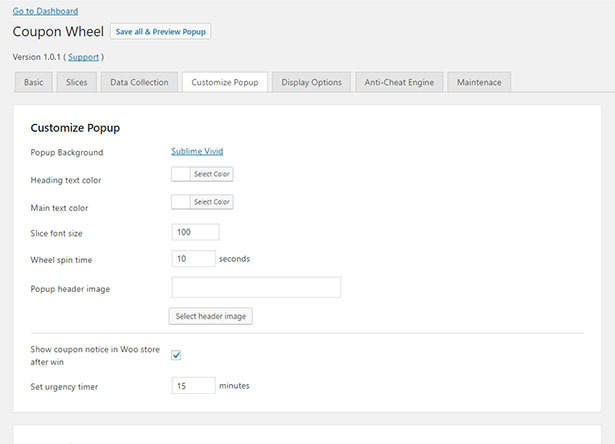 Go to our DEMO SHOP and wait for popup or make an exit-intent to test it out. 12 customizable slices – Customize slice label and coupon code for each slice. 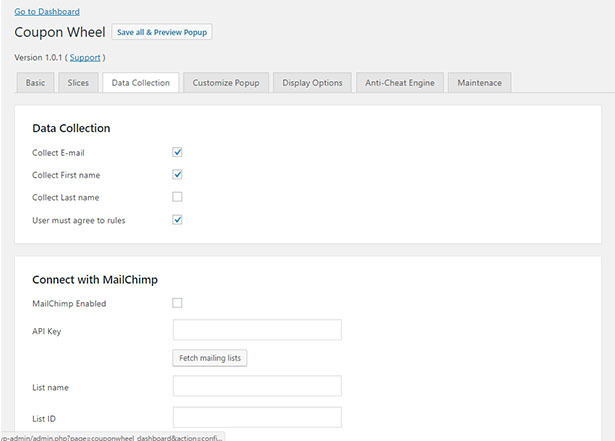 100% Server-side controlled – Precisely set which coupons and how much you want to issue. 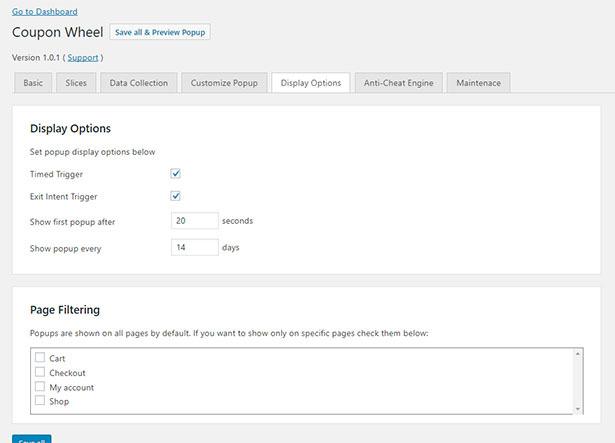 Popup Preview mode – To test your Coupon Wheel fully and not disrupt website before going Live. 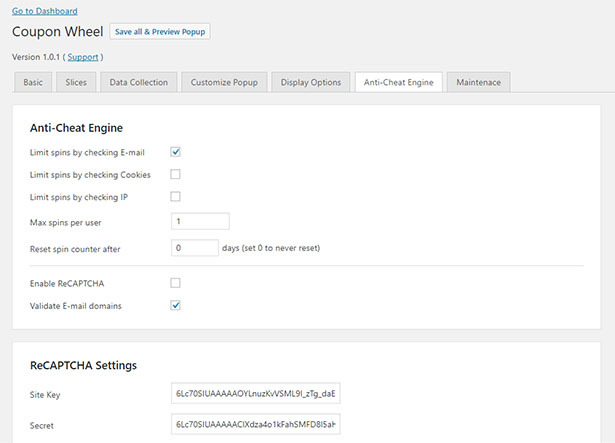 Advanced Anti-Cheat Engine – Set spin limiter based on e-mail, cookies or IP, ReCAPTCHA support. Every spin is logged. We also developed and included realtime e-mail domain validator, how bow dah. Performance oriented – Coupon Wheel is highly compatible with page caching / minifiyng plugins like W3 Total Cache, WP Super Cache, WP Fastest Cache, Autoptimize etc.. We care for your optimal website performance! Popup display options – Exit-intent trigger & Timed trigger. 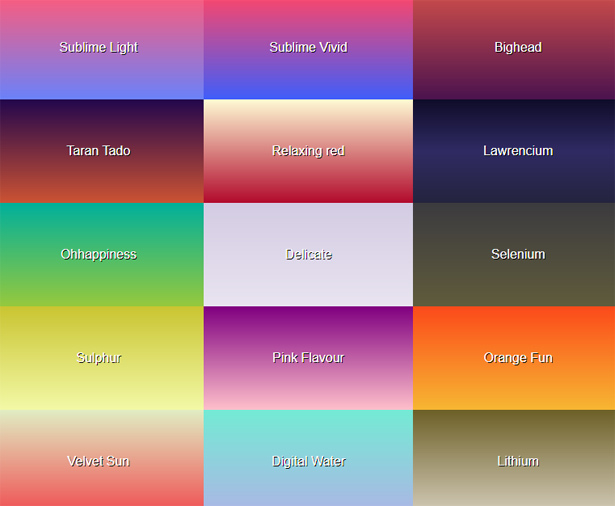 Also text color customization and 250+ beautiful popup gradient backgrounds to choose from. Unlimited Wheels – Make, clone, display any number of Coupon Wheels. Mobile & Desktop friendly – Tested and designed to work flawlessly with all major browsers and devices. 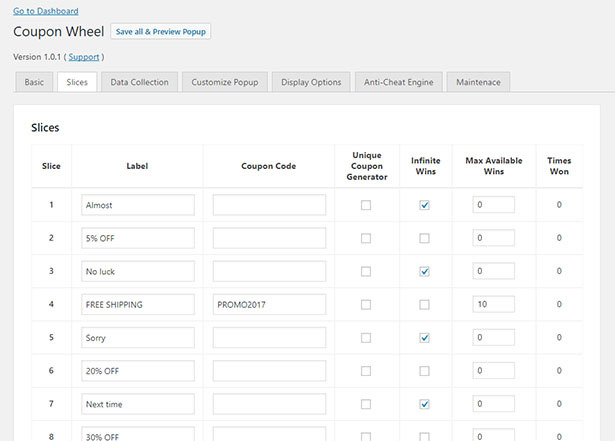 Page Filtering – If you want to display Coupon Wheel only on specific pages (eg. landing page).